Life Hike, paddle and zipline your way through a weekend in Whistler, B.C. The River of Golden Dreams in Whistler, B.C. Travelling to the West Coast from Toronto, I've always loved that the time-zone change instantly transforms me into the type of person who wakes up at 6 a.m. without an alarm clock. But I doubly appreciated every minute of those three blessed hours on a recent getaway to Whistler, where I challenged myself to pack the best of a Canadian summer into just a few days. Although you may know it as Canada's biggest ski resort, on the first morning of my visit, Theresa Ginter – general manager at Nita Lake Lodge – remarked that she lives for summers in the mountain town, despite being originally drawn there from Germany for the snowboarding. It's a refrain I heard again and again during my visit, from the server who brought me a cup of gazpacho and fresh lemon soda – zippy with ginger – at the tapas spot Bar Oso, from vendors at the farmers market that lines the Upper Village stroll twice each week and just about every other local I talked to, save for my biking guide who came for the single track and then fell for the snow. The stats back up the sentiment: A little over a decade ago, visits in July and August didn't clear even a quarter of ski season's million-plus, but summer hotel occupancy rates now edge out winter levels (that said, warm-weather room prices are still lower, especially this late in the season). Nicklaus North Golf Course. Whistler is a golfer’s paradise, hosting four championship courses. "I used to count seasons by the number of times I used my lift pass," Ginter told me as we crossed a suspension bridge high over the churning aquamarine waters of the Cheakamus River on a hike out to an old CN Rail train wreck, one of Whistler's newest trails. "Now, I count how many days I can golf." I'm not a golfer – though if you are, Whistler has four championship courses – but I do hike, bike, canoe, kayak, barbecue, stand-up paddleboard, zipline, enjoy a cold beer and all other manner of summer fun. And having packed a whole summer's worth of all of the above into a single weekend, I offer you this: If you squandered your summer – or, like me, you're based in Ontario, where the summer of 2017 felt like a failure to launch – Whistler is the fix. 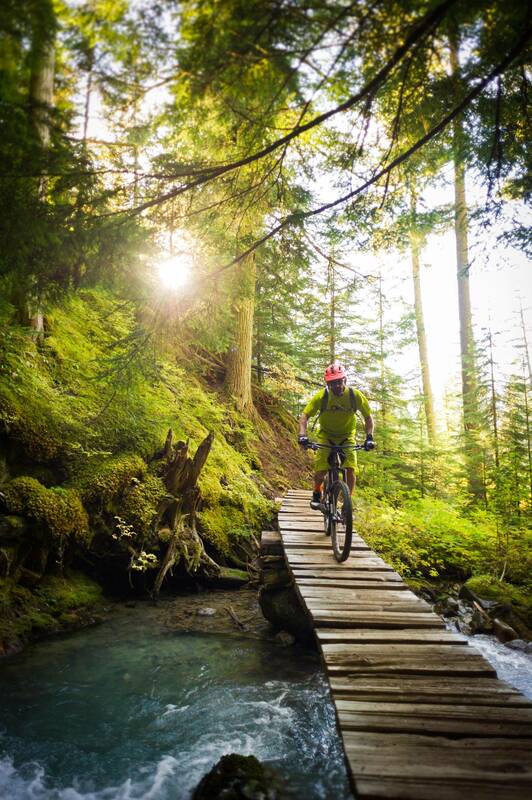 Though Whistler Mountain Bike Park provides access to more than 1,500 metres of downhill trails, you don’t have to be the least bit hard-core to enjoy Whistler on two wheels. 6:30 a.m. The good news about saving your summer getaway until now? You can sleep until 6:30 and still wake up at the crack of dawn. Consider staying at Nita Lake Lodge, the only lakefront hotel in Whistler, so you can ease into the day with B.C.-roasted coffee brewed in your in-room French press paired with views of the water and Mount Sproatt. If the lake is calling your name, pop downstairs for a quick stand-up paddleboard session (rentals are free for Nita Lake Lodge guests); with a perimeter of just 1.4 kilometres, there's plenty of time for a couple of laps before breakfast. 9:30 a.m. Though Whistler Mountain Bike Park provides access to more than 1,500 metres of downhill trails, you don't have to be the least bit hard-core to enjoy Whistler on two wheels. The gentler option? Arbutus Routes' Scenic Valley Tour, a 2.5-hour cruise around Lost, Green and Alta Lakes on paved and gravel trails. 1 p.m. Summer isn't summer without the sweet waft of wood-fired meat, am I right? So get thee to Hunter Gather, an airy barbecue restaurant that opened this season in a former 7-Eleven. Devour your Dippy Do Dat brisket sandwich – 18-hour smoked beef served on a bun with horseradish mayo and caramelized onions – out on the patio, of course, at a table with its own built-in herb garden. 3 p.m. Another mandatory taste of the season? Cold beer. Good thing Whistler's got three craft breweries. Head over to the formerly industrial Function Junction area to find two of them: Whistler Brewing Company, founded in 1989, and Coast Mountain Brewing, which opened late last summer and whose Forecast West Coast American-style pale ale is a favourite at taps all over town. 7 p.m. You may have missed this summer's famed Longtable Dinner Series, a beloved annual event where chef James Walt transports his restaurant to a magical outdoor farm setting, but it's not too late to enjoy the abundance of late-summer produce, all sourced from nearby farmers, at Walt's Araxi Restaurant. Whet your appetite with another summer must, the Firecracker Margarita, made with hibiscus, basil and a tongue-tingling dash of jalapeno. The Whistler and Blackcomb mountains offer more than 50 kilometres of hiking trails. 8 a.m. Today is all about that hulking playground – a.k.a. Whistler and Blackcomb mountains – with its more than 50 kilometres of hiking trails and other alpine fun. Summer on the mountain is actually something of a misnomer – it's more like an evolving series of mini-seasons, from May and June, when winter snow still clings to the peaks, through to the still-warm days of late summer. The rainbow of wildflowers that blanket the foothills of Whistler and Blackcomb in midsummer may be past its prime, but the green is still dotted with purple and fuchsia Arctic lupine and alpine fireweed and other holdouts. Skip the lift and get a cardio boost by climbing the Blackcomb Ascent Trails, three interconnected trails which climb from the Upper Village through old-growth coastal rain forest and up to the Rendezvous Lodge, a total elevation gain of 1,200 metres. Keep your eyes peeled as you hike for bears and marmots (bet you didn't know Whistler is named after the whistling sound those giant rodents make). If your heart's not pounding yet, the Sasquatch zipline is guaranteed to do the trick: At more than two kilometres across, the line, which runs from Blackcomb over the Fitzsimmons Valley all the way to Whistler, is the longest and fastest in Canada and the United States – far more thrilling than any ride at the Pacific National Exhibition or Canadian National Exhibition. Spend the rest of the day on high enjoying the view, whether from the glass-bottomed Peak 2 Peak gondola or from one of the alpine hiking and running trails. Need a snack after all that activity? Pick up some local goodies at the Whistler Farmers Market. 10 a.m. It's not a proper Canadian summer without a canoe and, accordingly, this itinerary wouldn't be complete unless I sent you for a paddle. But canoeing the River of Golden Dreams isn't the tranquil ride you may be envisioning – its five kilometres of fast-moving waters and narrow turns make for extreme (and extremely fun) canoeing. It's a safe bet that somewhere between Alta and Green Lakes, you will run aground, get stuck in a dense tangle of foliage, crash into another canoe, tip your boat, or some combination of all of the above. The locals don't call this the River of Broken Marriages for nothing – but really, the challenge is part of the fun. 1 p.m. Now's your last chance to taste the literal taste of summer: peaches so luscious the juice drips down to your elbows. Hit the Whistler Farmers Market – it's still on every Sunday until October – for the last of this year's harvest and assorted local goodies – from handmade chocolates to cocktail syrups. Live music, thin-crust pizza baked in a mobile wood-fired oven and kombucha on tap? There's that, too. 4 p.m. This is it. Your final summer shebang, and it's a good one: Whistler's take on the classic cookout. But you didn't hold out this long for frozen hot dogs and hamburgers at a dusty camp site, did you? Didn't think so. Instead, hop an ATV and climb nearly 2,000 metres for a salmon bake on the best patio in town. It's a rugged, bumpy ride up to Crystal Hut, a log cabin with a wraparound deck overlooking the village and Coast Mountains, but this could be the best spot in the world for watching the sun fade out on the summer of 2017. Try your hand at fishing on Nita Lake. Whistler's only lakefront resort, Nita Lake Lodge offers free paddle sports and a waterfront patio. From $139 plus tax. nitalakelodge.com. In addition to one of the best pool scenes in town (yes, there are blender drinks), Fairmont Chateau Whistler's Whistler Experience Guide program offers daily complimentary biking, hikes such as Train Wreck trail and other seasonal activities. From $215 plus tax. fairmont.com/whistler. Arbutus Routes for private and group bike tours. arbutusroutes.com. Canadian Wilderness Adventures ATV, canoe and all-season adventures. canadianwilderness.com.